Not exactly my usual dinner venue – this place was more used to spinning propeller blades than appetizers. being shut down. Motorcycles parked in a circle around the table, glittering and gleaming in the candlelight. It was chaos, burbling and happy and the kind of party that is only halfway planned and all the way worth attending. And I was just enjoying being along for the ride. Welcome to the 2018 Moto Social Camp event. 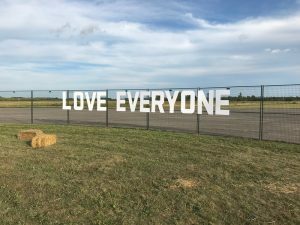 For those of you who haven’t heard of it, the Moto Social is a motorcycle event that is somewhat unique in that it is all about the people and not the machines. 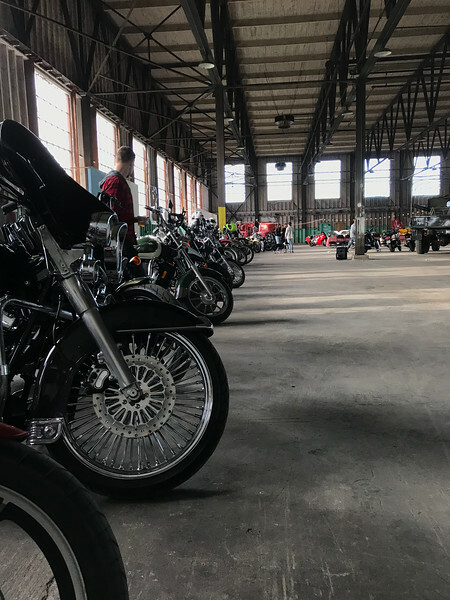 It’s held monthly in various major cities around the globe, and they invite motorcycle enthusiasts and those just curious about the lifestyle to meet up and have the chance to talk to other people with similar interests. It’s also worth mentioning the event was created in coordination with Jack.org, an organization dedicated to education about youth and mental health issues – and that the event was equally about raising funds for a very worthy cause. Because what could be more social than watching out for those vulnerable members of the society we live in? And having a good time doing so as well. New and old seemed to be the theme – at least for the setting and the machines attending. next to brand spanking new cruisers – it isn’t about the machine at all. It’s about having an interest in riding, and sharing that interest. A reminder of the theme and spirit of the Moto Social gatherings. Their webpage uses slogans like “Everyone is Welcome! Bike or no bike. Good vibes only!” and they most truly, absolutely, do believe this. And that is refreshing – and just maybe the future of motorcycling events, but more on that later. #TheMotoSocialCamp is the first event of its’ type held by the Moto Social organization, an ambitious effort to go well beyond an evening meetup for coffee – to a multi-day weekend camping event which gives an opportunity to really meet and interact with other two (and three) wheeled riders for more than an hour or two. 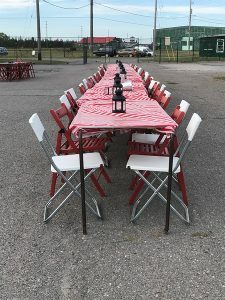 We started out Friday by making the drive from Toronto out to PIcton, Ontario – where the event would be held at the PIcton Airfield a WW2 era airfield currently run as a private airfield and industrial park. This ain’t your typical picnic in the park. live music, a gourmet meal by top Canadian chefs on Saturday night and you start to get the picture of just what an unexpected journey this was. This wasn’t your typical cup of coffee parking lot meet, this was something else – something unique. Something special – and I think that it will grow to be recognized as such if we are lucky enough for the organizers to keep on doing this event. We had arrived early, so after chatting briefly with one of the organizers we took the scooters around one of the hangers and down the taxiway, ending up at a large grassy area which would be the campground for the weekend. We only had to move the tent once after being informed we’d managed to pitch it on a taxiway for the local flying club. Oops. Friday night was a local BBQ truck with things like briscuit and pulled pork – and it was delicious. 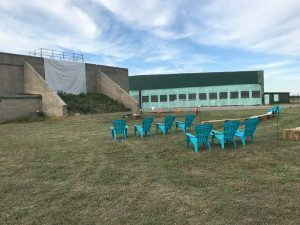 This was followed by live music, and motorcycle related movies shown on a screen hung from a concrete structure used for testing airplane machine guns during the WW2 days when the airfield was used as a gunnery and bombing school for pilots training to go overseas. This relic of the wars made a handy screen for the motorcycle flicks shown both Friday and Saturday night. 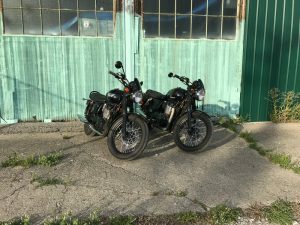 It was a chance for my wife and I to talk to other motorcyclists – swapping stories of other rides and events, and share our experiences while finding out about theirs. We found a few people who knew people we knew in the motorcycling community, or who had been places we had been – and also heard about a few places we added to our own travel bucket list. 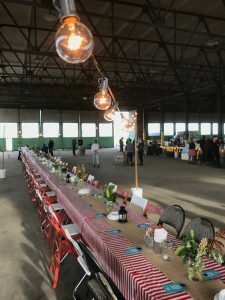 Saturday night was also a special dinner – with Canadian chefs such as Albert Ponzo, Jamie Kennedy, and Alexandra Feswick preparing a 5 star meal in the middle of a second world war airplane hanger. An amazing dinner, in an unlikely place. The evening started with bikes pulling into the hangar, forming an honour guard of sorts around the tables. Craft beer from local producers was available, and soon a variety of delicious gourmet offers as appetizers and a several course main meal. We met locals and others who had travelled from several places around Ontario, ages ranging from those barely out of their teens to those well into retirement. 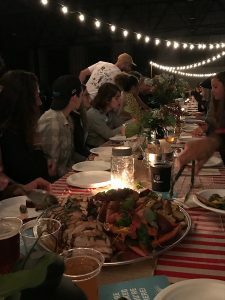 If #TheMotoSocial is about bringing people from different backgrounds together, this dinner alone was evidence of the success of the concept. After enjoying this and another evening of live entertainment – we retired to the campsite off to one side of the runway. So in the end – if you asked me if I were to recommend attending the next #TheMotoSocial camp event – what would I say? If you get the chance, get yourself to an airfield in the middle of nowhere – because you’ll be missing out if you don’t. The Junk Run – Report (Belated) and Wrapup!